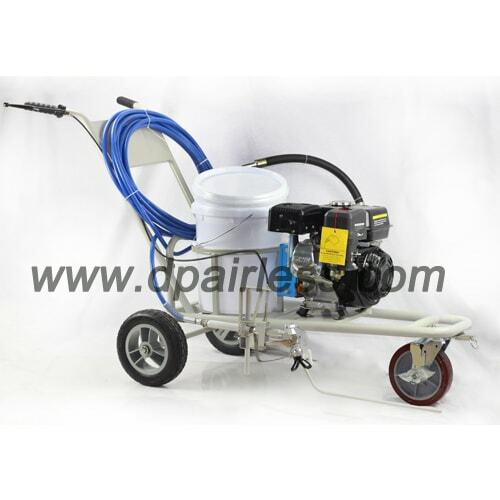 DP-6335L airless liner striper / roadline painting machine is a higher output (attached with 2 spray guns) and longer sustained use design, good for your continuous heavy-duty line striping requirements. It’s similar to PowerLiner 2850. Ideal for medium size projects on athletic fields and pavement working, easy maneuverability makes turns and stenciling easy and fast. Big output, finish striping jobs fast. This line painting machine support two guns spraying at the same time. Medium size marking machine is perfect for the working place where the big machines just aren’t profitable to operate. Powerful fluid pump is ideal for low to high viscosity traffic paints spraying. Digital display, easy control and operate. Flow-through Easy out Manifold pump filter comes out, reduces tip clogs and ensures quality finish. Durable stainless steel fluid section. Similar to PowerLiner 2850 line painting equipment. Can i get a quote of this product and other road line marking machines. For only one item each.